The 2017 Strokes of Art in the Square kicks-off the 18th Art in the Square (April 28-30) on February 19, 2017 in the foyer of Southlake Town Hall from 5-6:30. This free reception for the community offers creative visual arts, music, and refreshments. 2017 beneficiaries will be announced. Guests will be the first to view artwork by the 2017 Art in the Square featured artists. One of the featured artists will be named the People’s Choice Winner. Voting begins at Strokes and will end on April 1st. The community is invited to visit Town Hall and cast a vote for their favorite. Tastings will be provided by local restaurants. Entertainment is guitarist, Jackson Eli. Strokes is co-sponsored by the Southlake Arts Council, Apex Arts League and Art in the Square/Southlake Women’s Club. 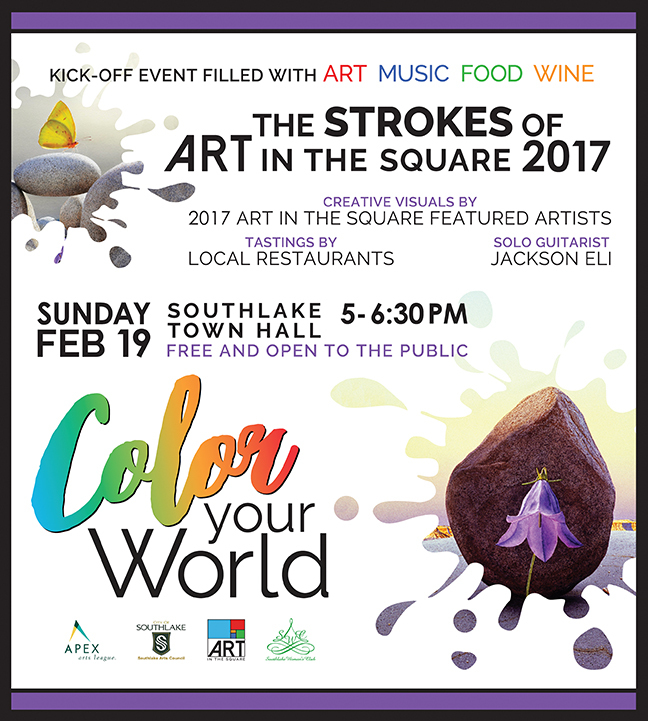 “Color your world” by attending Art in the Square, April 28-30 at Southlake Town Square.